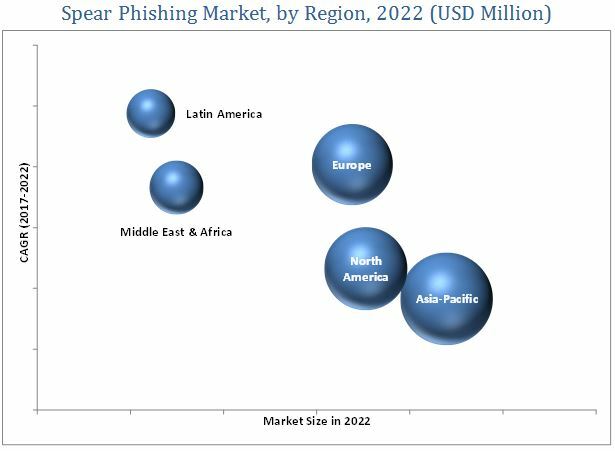 [130 Pages Report] The spear phishing market is projected to grow from an estimated USD 840.70 Million in 2017 to USD 1,401.6 Million by 2022, at a Compound Annual Growth Rate (CAGR) of 10.8% during the period 2017–2022. The research methodology used to estimate and forecast the spear phishing market begins with capturing data on key vendor revenues and the market size of the individual segments through secondary sources such as Information Systems Security Association, Center for Internet Security Association, and National Cyber Security Association, journals such as National Cybersecurity Institute Journal, International Journal of Cybersecurity and Digital Forensics, International Journal of Information Security, and International Journal of Network Security, annual reports, white papers, certified publications, press releases and investor presentations of spear phishing solutions and service vendors, as well as articles from recognized industry associations, statistics bureaus, and government publishing sources. The spear phishing market ecosystem includes players such as Microsoft Corporation (U.S.), BAE Systems (U.K.), Barracuda Networks Inc. (U.S.), FireEye Inc. (U.S.), Checkpoint Software Technologies Ltd. (U.S.), Cisco Systems Inc. (U.S.), Proofpoint (U.S.), Forcepoint LLC. (U.S.), GreatHorn, Inc. (U.S.), Intel Corporation (U.S.), and RSA Security LLC. (U.S.) which provide solutions and services required in spear phishing protection. The spear phishing market is expected to grow from an estimated USD 840.7 Million in 2017 to reach USD 1,401.6 Million by 2022, at a Compound Annual Growth Rate (CAGR) of 10.8% during the forecast period. The major drivers for the high demand in the market include increasing incidences of spear phishing attacks and increasing adoption of BYOD policy in organizations. The scope of this report covers the spear phishing market analysis by component, by deployment type, by organization size, by vertical, and by region. The solution segment is expected to grow at the highest CAGR during the forecast period owing to the extensive adoption of these solutions by various enterprises, such as BFSI, government & defense, healthcare, and retail to increase the efficiency of their IT security. These solutions help in monitoring emails and email gateways, and prevent data loss by providing complete visibility of inbound and outbound emails across a range of industries. 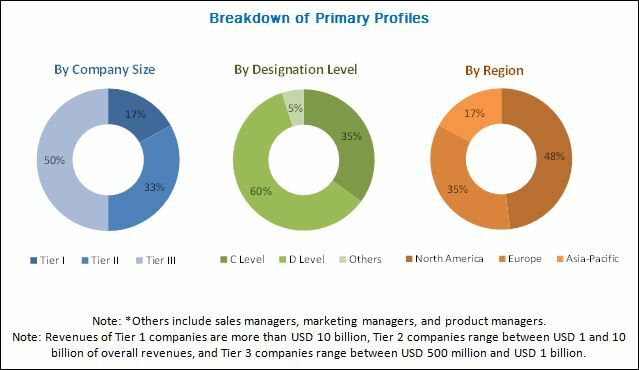 The service segment is expected to hold the largest market share during the forecast period owing to the early adoption of email security services as compared to solutions. These services offer lucrative growth opportunities to service vendors by offering data analytics and data visualization services to organizations to detect and reveal attack campaigns, the source of attacks, and targeted users. The Banking, Financial Services and Insurance (BFSI) vertical segment is expected to hold the largest market share during the forecast period owing to the requirement of security products and services that can protect employees, customers, assets, offices, branches, and operations. Furthermore, enhancement of business operations and expansion of customer base makes the industry a lucrative target for fraudsters, fueling the adoption of spear phishing solutions and services in the BFSI vertical. Latin America is expected to witness high growth in the spear phishing market over the forecast period due to increasing digitization, online browsing, and use of mobile devices. Countries such as Mexico, Brazil, Argentina, Chile, Panama, and Venezuela, among others are expected to witness an increasing number of spear phishing attacks, which is expected to augment the adoption of advanced email security solutions. A few of the restraining factors that affect the growth of the market are lack of awareness about current threats and cyber-attacks and concerns of organizations regarding outsourcing security services. The spear phishing market vendors profiled in the report include Microsoft Corporation (U.S.), BAE Systems (U.K.), Barracuda Networks Inc. (U.S.), FireEye Inc. (U.S.), Checkpoint Software Technologies Ltd. (U.S.), Cisco Systems Inc. (U.S.), Proofpoint, Inc. (U.S.), Forcepoint LLC. (U.S.), GreatHorn, Inc. (U.S.), Intel Corporation (U.S.), and RSA Security LLC. (U.S.). 13.3 Check Point Software Technologies Ltd.
*Details on Overview, Company Scorecard, Product Offerings, Business Strategies, Recent Developments, MnM View might not be captured in case of unlisted companies.